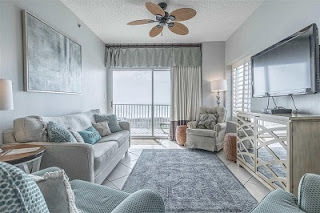 Orange Beach AL beachfront condo for sale at Tidewater. 3BR/3BA Unit w/ Gulf facing balcony in living room and master bedroom. Beautifully decorated in coastal cottage decor - featuring plantation shutters, relaxing blue, green, and gray tones, updated light fixtures, granite counters in kitchen and much more. Unit is sold as viewed, rental ready with a few exceptions. Property will sleep 8 guests for rental purposes.